Early in 1919 the Aircraft Manufacturing Co. Ltd. were already considering the type of aircraft best suited to the era of civil flying which lay ahead. Experience gained in converting the rear cockpit of the military D.H.4 into a cabin for two passengers and successful operation of the resultant D.H.4A by R.A.F. Communications Squadrons, undoubtedly influenced their decision to build a somewhat larger machine in the same configuration. 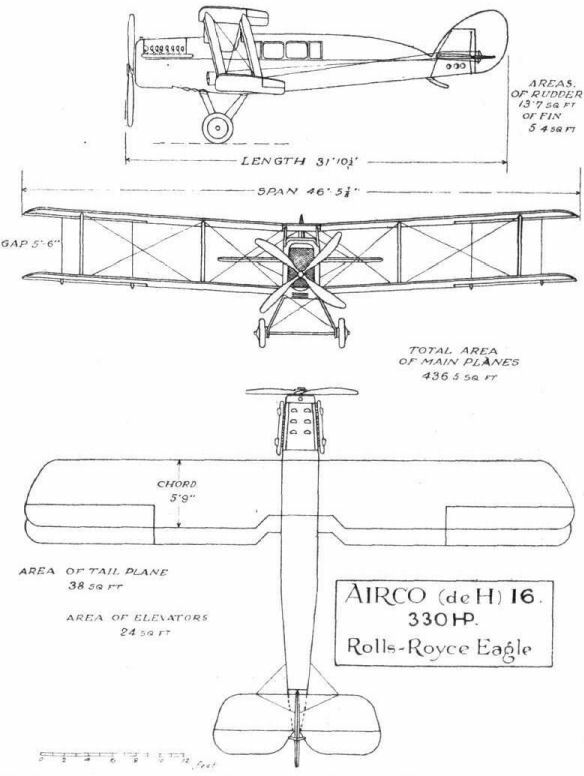 The D.H. 16, Airco's first purely civilian type, was consequently built from D.H.9A instead of D.H.4 components and the rear fuselage was widened to seat four passengers in facing pairs in a glazed cabin. Although powered by the 320 h.p. Rolls-Royce Eagle VIII engine of its predecessor, it was faster and carried four instead of two fare paying passengers, making it a considerably more economical and commercially attractive aircraft. The prototype first flew at Hendon in March 1919 in contemporary khaki drab with red, white and blue rudder. In the following May it entered service with Aircraft Transport and Travel Ltd. bearing the temporary civil marking K-130. With 'Joy Loan' advertisements painted under the wings, it toured the provinces, visiting among other places Harrogate where pleasure flights were given on Whit Monday, June 9, 1919. 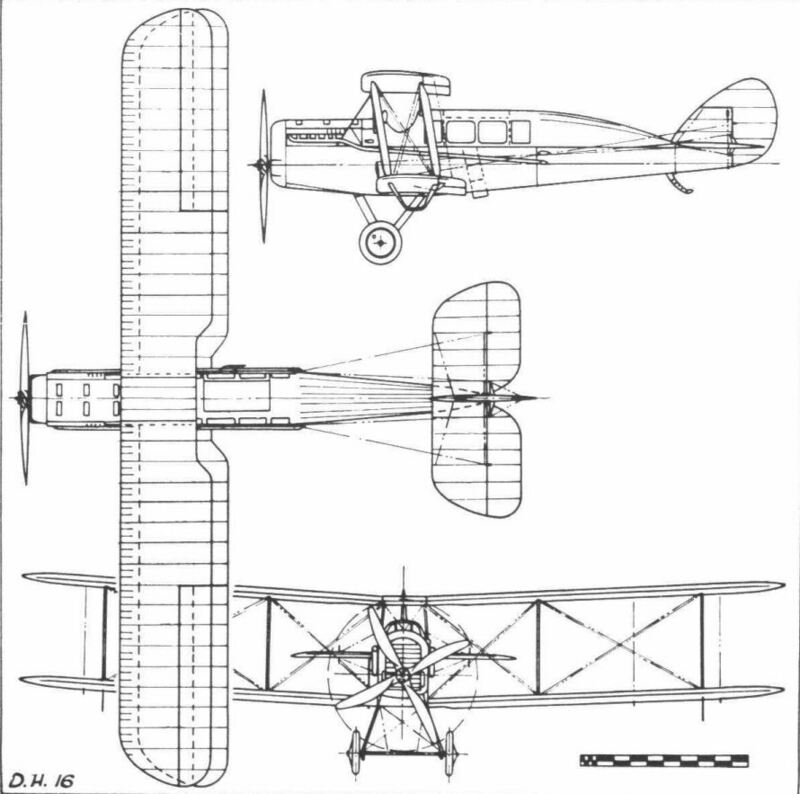 Thus although the D.H. 16 was inspired by the military D.H.4A, it antedated the entry into service of the first civil D.H.4A by two and a half months. In July 1919 the D.H.16 flew to Amsterdam where it was immaculately polished and shown without mainplanes on the Airco stand at ELTA, the First Air Traffic Exhibition. 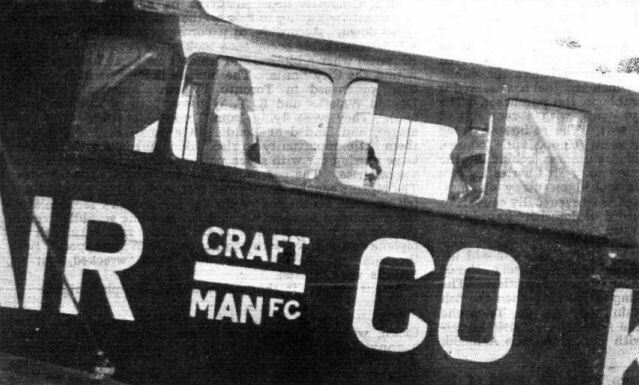 Bearing the nationality mark G on the rudder, the same aircraft, piloted by Major Cyril Patteson, was, on August 25th, used to fly the inaugural scheduled London - Paris service. Before production ceased in June 1920, nine D.H. 16s had been constructed, one of which was experimentally fitted with air brakes and flaps. One was sold to the Sociedad Rio Platense de Aviacion (River Plate Aviation Co. Ltd.) at Buenos Aires for a highly successful cross river ferry to Montevideo but the remainder were used on the Continental services of Aircraft Transport and Travel Ltd. The final three were fitted with the heavier and more powerful Napier Lion engine and although in the opinion of some pilots the increase in wing loading made them tricky to handle, they set up new standards in reliability. During one week in the summer of 1920 the Lion engined D.H. 16 G-EAQS made seven return trips between Croydon and Paris within six days, making fastest time of the week in each direction. 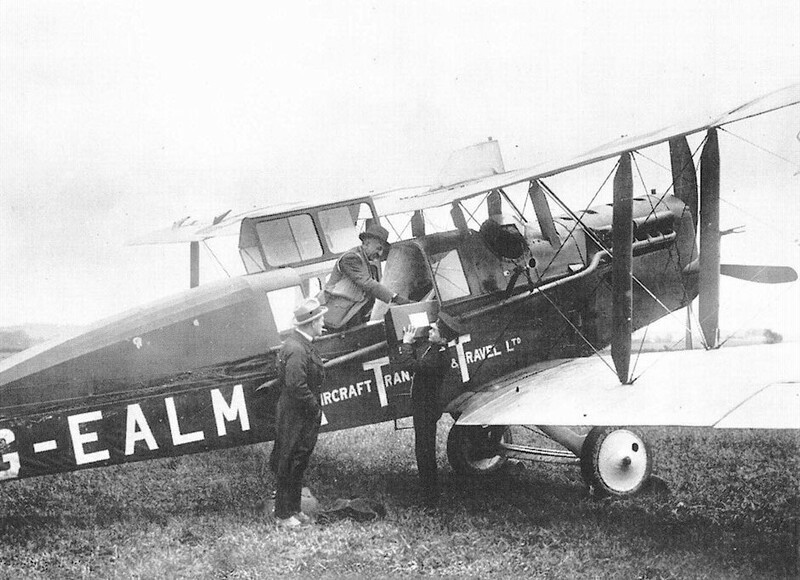 In those days K.L.M., the Royal Dutch Air Line, had no aircraft of its own, so that the honour of making the first K.L.M. scheduled service between Croydon and Amsterdam fell to Capt. H. 'Jerry' Shaw and the Eagle powered D.H.16 G-EALU "Arras". 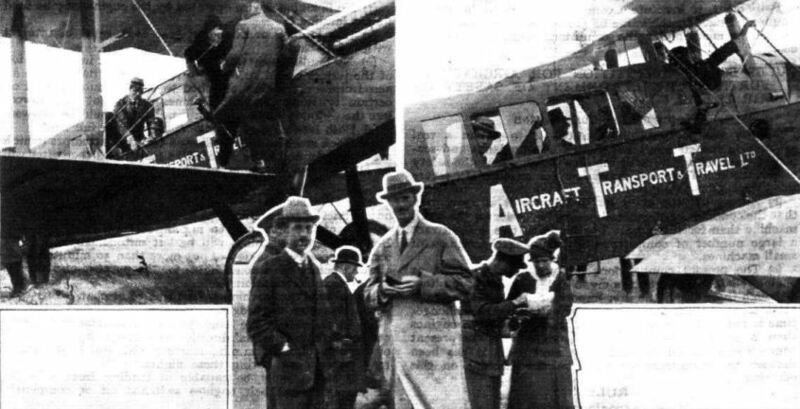 This flight took place in extremely bad weather on May 17,1920 and carried two British journalists, a bundle of English newspapers and a congratulatory letter from the Lord Mayor of London to the Burgomaster of Amsterdam, in a flight time of 135 minutes. K.L.M. schedules were thereafter all flown by Aircraft Transport and Travel Ltd., but when the firm closed down in December 1920, its aircraft, including seven surviving D.H.I6s were stored in a Bessoneau hangar at Croydon, where all but two were broken up in 1922. The exceptions, G-EALM and 'FT, were taken over by the de Havilland Aeroplane Hire Service in 1922 and after overhaul at Stag Lane went to Lympne for use on early morning newspaper flights to Ostend. A brisk business was also done in bringing back four casual passengers per trip at ?3 a head. The D.H.16s were later based at Stag Lane, ready to go anywhere at ?11 per hour. On December 5, 1922 both D.H.16s took part in an early air freight experiment by flying consignments of a special Ulster edition of The Times from Sealand to Aldergrove on the day of issue, but after G-EALM crashed near Stag Lane during a test flight on January 10, 1923 with the loss of the pilot, R. E. Keyes, G-EAPT was dismantled and the type became extinct. Span 46 ft. 51 in. Height 1 1 ft. 4 in. Wing area 489 3/4 sq. ft.
* Weights: Tare weight 3.155 lb. All-up weight 4.750 lb. Maximum speed 136 m.p.h. Cruising speed 100 m.p.h. Initial climb 1,000 ft. min. Ceiling 21.000 ft.
* With Napier Lion engine. Constructor's No. C. of A.
owing to lack of space, has not been able to show a complete machine, but this is to a great extent made up for by the astounding variety of exhibits displayed on this stand. The centre of attraction is formed by an Airco (D.H.) 16, which is minus its wings but otherwise complete. It is fitted with a Rolls-Royce engine which has seen a great amount of active service, although the casual onlooker would scarcely guess it, as the engine has been cleaned up and painted until it looks like new. The whole machine is very highly finished, what with polished aluminium, glossy enamel and plated fittings and exhaust pipes. The luxuriously finished cabin has seating accommodation for four passengers, the seats being arranged in pairs, of which the seats of each are facing, and staggered in relation to, one another. This feature of the Airco 16 was shown in a photograph published in FLIGHT recently. For communication with the pilot there is a small door in the front wall of the cabin, through which the foremost passenger can give his orders to the pilot. For flying at night the machine is provided with a generator which furnishes current for the navigation lights as well as for the bulbs illuminating the cabin. In addition to the Airco (D.H.) 16, there is shown on this stand a number of Airco metal fittings and other parts, and the rear portion of a. fuselage, showing the detail construction. A Napier "Lion" attracts a great deal of attention, as the "broad arrow" type of aero engine evidently is not a familiar sight in Holland. Another exhibit on the Airco stand which is greatly appreciated is a large glass case containing an excellent model of the Hendon Aerodrome, and a number of small-scale models of Airco machines and of a kite balloon. There is even a neat little scale model of a Hucks starter. A number of large coloured photographs of Airco machines completes the exhibits of this firm. On the aerodrome, however, there are two Airco machines, a 4A flown over by Capt. Saint and a 9 brought across by Mr. Lawford. MONDAY last saw the inauguration of the daily air service between London and Paris organised by Messrs. Aircraft Transport and Travel, Ltd. Two Airco machines set out from this side and one machine from Paris. An Airco 4 machine, fitted with Rolls-Royce engine, left Hounslow at 9.10 a.m.; it was piloted by Lieut. E. H. Lawford, and carried Mr. G. M. Stevenson-Reece, of the Ereuing Standavd, as well as a full load, including a number of daily newspapers, a consignment of leather from a London firm to a firm in Paris, several brace of grouse, and a considerable number of jars of Devonshire cream. It arrived at Le Bourget, the Paris terminus, at 11.40. At 12.30 p.m. an Airco 16, fitted with Rolls-Royce engine, left Hounslow for the regular journey to Paris, the landing being made at 2.45 p.m. Major Cyril Patteson was the pilot, and four passengers were carried. One machine - an Airco 4A - left Paris at 12.40 p.m., and, piloted by Lieut. J. McMullin, with Lieut. Lawford and Mr. V. M. Console of the Daily Mail as passengers, it arrived at Hounslow at 2.45 p.m. Although the Handley Page service does not start its regular running until Monday next, a preliminary trip was made last Monday. The machine used was of the twin-engined type and the pilot was Maj. Foot, while the 14 passengers included Mr. L. A. Northend, of The Times; Maj. C. C. Turner, Daily Telegraph; Mr. E. A. Perris, of the Daily Chronicle; Mr. Harold Begbie, Daily Chronicle; Mr. Tourtell, Daily Express; Mr. Bartholomew, Daily Mirror; and Mr. Crosfield, Daily News. The machine started from Cricklewood at 8.20 a.m., called at Hounslow for Customs formalities, was away at 9.20 a.m., and landed at Le Bourget at 1.15 p.m. Owing to difficulty in obtaining petrol the return journey was postponed to the following day. 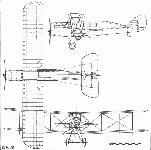 is a development of the original D.H. 9A. This machine also is fitted with a Rolls-Royce "Eagle," but is of considerably greater area and carries four passengers in addition to the pilot. One of these machines was exhibited at the E.L.T.A. show at Amsterdam, when we referred to it briefly. As in the Airco 4A the pilot sits between the planes, which are, however, staggered and project, in the case of the lower one, some little distance along the sides of the cabin. In this, which is formed similarly to that of 4A, are housed four passengers. The seats are slightly staggered in relation to each other, the first passenger facing aft, the second forward, the third aft, and the fourth forward. The weight of this machine is approximately 3,000 lbs. empty but including water, while with full load of pilot, 4 passengers, and fuel for about 3 hours, the total weight is about 4,400 lbs., or 10 lbs. per sq. ft. In addition to the 4A and 16, a certain number of D.H.9's are also used. These are of the open type, and in the main differ from the original D.H.9 in that three seats are fitted instead of two. The engines fitted are Siddeley "Pumas." The main exhibit on this firm's stand will be the new Airco (D.H.) 16. Machines of similar type are, of course, already familiar from extensive use on the London-Paris air route, but the show machine will differ in several respects from the standard type. The chief alteration will be found in the engine unit, which, in the show machine, will be a 450 h.p. Napier Lion instead of the Rolls-Royce with which the standard machine has been doing such excellent work. The fitting of the Lion has necessitated a slight alteration to the nose of the machine, as the new engine is of the "broad arrow" type instead of the usual Vee. The result is a slightly shorter and somewhat differently shaped nose, as shown in the accompanying silhouette. The radiator is no longer fitted in the nose of the fuselage, but is placed some distance back, and protrudes through the floor of the body, much in the same manner as that of the Airco 9R on which Capt. Gathergood recently established a series of British records. The employment of the higher-powered engine has naturally resulted in a considerably increased performance. The machine is to be shown in full "show finish," with white body, polished aluminium cowl and nickel-plated exhaust pipes, black undercarriage struts and tail skid, and cream wings and tail surfaces. The cabin, as in the standard Airco 16, is designed to accommodate four passengers, two facing forward and two facing aft. It is most luxuriously finished, and will give visitors an excellent idea of air travel de luxe. In addition to the complete Airco 16, there will be shown on this stand a series of coloured photographs, similar to those shown at the E.L.T.A. exhibition at Amsterdam, which were greatly appreciated, as well as an entirely new series taken on the London Paris air service route. A small section of the stand will be devoted to aerial photography, a new branch of the varied interests of this firm. Not the least interesting exhibition this stand will be a small scale-model of Hendon aerodrome, with the Airco works in the background, machines of different types standing about on the aerodrome, and one having its engine started by the Hucks starter. On this stand Messrs. Airships, Ltd., will also exhibit, among other items, the aeroplane flotation gear upon which this company is specialising, as well as a model of one of their small non-rigid airships, or "aerial yachts." K-130, first of Aircraft Transport and Travel Ltd.'s Eagle engined D.H. 16s, making a 'Joy Loan' pleasure flight at Harrogate on June 9, 1919. 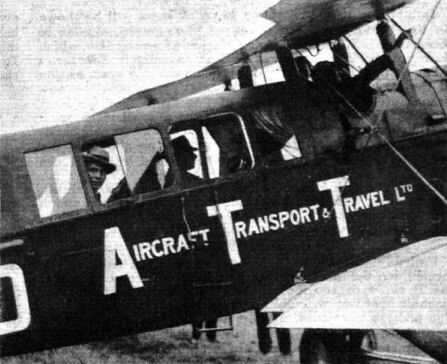 The four-passenger Airco/de Havilland D.H.16 operated Aircraft Transport and Travel's first cross-Channel scheduled passenger service, on 25 August 1919. Passenger entry to the cabin of the D.H.16 was similar to that of the D.H.4A - via an external ladder and hinged roof. THE LONDON-PARIS AIR SERVICE: Start of the service for Paris from Hounslow Aerodrome on August 25. The Airco machine embarking its passengers, and on the right the first Airco machine just leaving for the journey. Below Gen. F H. Sykes and Gen. Festing, who were present at the inauguration of the service. THE LONDON-PARIS AIR SERVICE: (1) A de H. (Airco) 16 arrives from Paris, carrying, among others, Miss Edie Thomas, the American concert singer. (2) Lieut. H. Shaw descending from his Airco 16 after piloting a load of passengers safely across from Paris. (3) One of the Airco 16 machines used on the London-Paris service. The D.H.16 G-EALU "Arras" with which Capt. H. 'Jerry' Shaw inaugurated the first K.L.M. Croydon-Amsterdam service on May 17, 1920. The penultimate D.H.16 G-EARU. c/n P.59, showing the Napier Lion installation. A French lady designer of one of the greatest London emporiums goes a flipping at Hendon in a D.H. enclosed machine, no doubt with designs on designs aviatic. THE D.H. (AIRCO) 16 MACHINES USED ON THE LONDON-PARIS ROUTE: Plan, side and front elevations to scale.